I do like an “everything-but-the-kitchen-sink” sort of pizzas. Oodles of toppings, lots of flavors. Mmm-mmm… Gluten Free Dairy Free Supreme Pizza is topped with pepperoni, sausage, mushrooms, black and green olives, peppers and onions and dairy free cheese substitute of your choice. Enjoy! 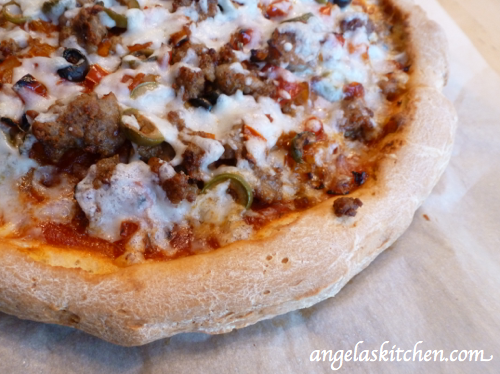 If you would like to freeze this pizza, make the crust (I shape it on parchment), top it, then freeze flat on a pan. After pizza is frozen, wrap well. When you are ready to bake, unwrap your pizza, put parchment with frozen pizza onto a pan or on the rack in your oven and close the door. At this point, turn on your oven to 400 degrees F, baking for about 25 minutes until baked through and crust is golden. I use my family’s favorite Gluten Free Dairy Free Pizza Crust (it is also free of soy and nuts, and can also be egg and corn free) and makes 2 13″ to 15″ pizza crusts. Free printable recipe card for freezer cooking (OAMC) or big batch cooking. Enjoy! Printable freezer labels for Supreme Pizza. This makes two 13 to 15" pizzas. Saute red, green and onion together until onions are translucent and vegetables are softened. Spoon sauce onto pizza crusts and spread to about 1 inch to the raised edges of dough. 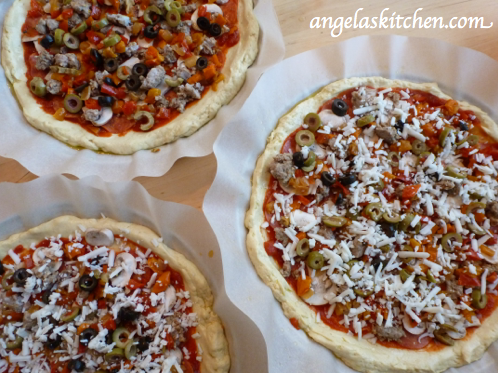 Dividing between the two pizzas, top with pepperoni, sausage, mushrooms, peppers and onions, black and green olives. To freeze: Add non-dairy cheese substitute if using. Wrap with plastic and place in coldest part of the freezer. When frozen, you can remove the pizza from the pan and place on a circle of cardboard to prevent breaking while being stored. Wrap pizza well with plastic and foil. To serve: Unwrap pizza, leaving parchment. 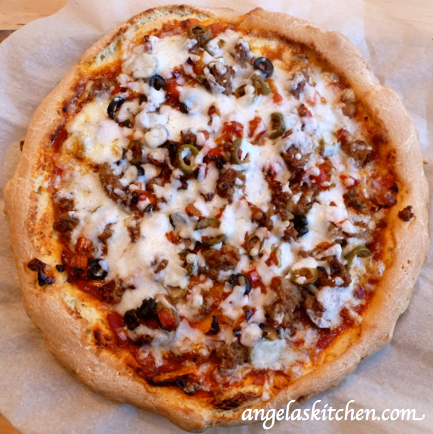 Put pizza on pizza pan or baking sheet; place in cold oven. Turn oven to 400 degrees. Bake until crust is golden and toppings are bubbly. Hi! This looks great! I was wondering where I might find a recipe for the mock-zarella shreddable cheese or the pizza cheese sauce that you reference in the recipe. We are newly GFCF, and the cheese has been soooooo hard to give up. I can manage pretty easily w/o the gluten, but the cheese is so tough!